The upshot of it is that running the printer for extended periods caused a very well documented manufacturing fault in the electronics to rear it's head... 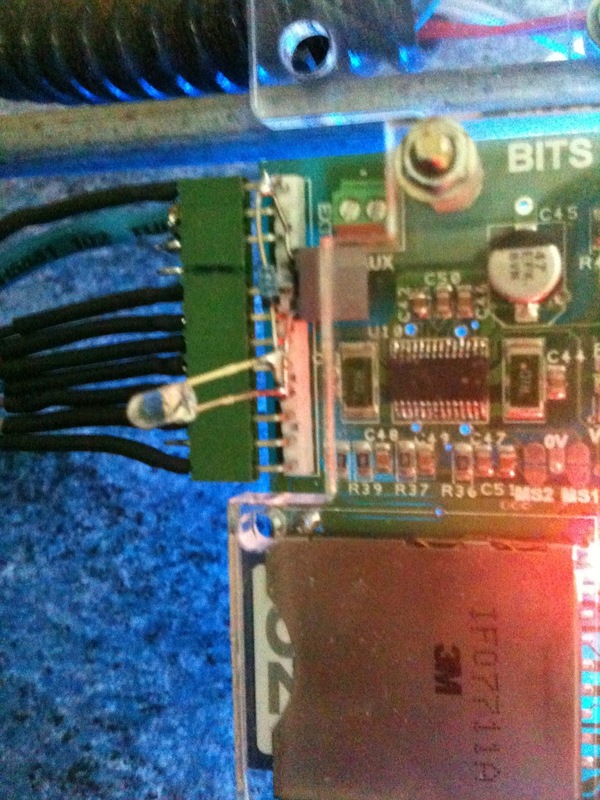 There is no real protection for the ADC of the microcontroller reading the thermistor in the extruder. A machine made of insulating plastic brackets supporting a metal frame. Hot molten plastic flowing through a conductive extruder nozzle. And a fan continuously blowing air over the nozzle and work piece. The above is a very good recipe for static electricity :) Whenever the relative humidity droppled below about 50% the machine would start crashing randomly. Throwing away three or four hours worth of printing was starting to get a little frustrating so I went in search of answers. 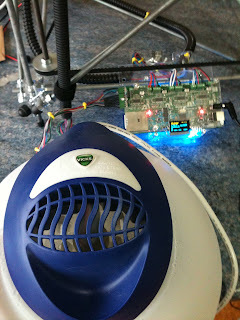 The machine as it is uses about 50W and the humidifier uses another 250W, Ethically I have an issue with increasing the power consumption of a machine by 6x just because of a design flaw. From an engineering point of view a lot of humidity around electronics and bearing surfaces is never good. And it makes the room damp in winter! Above is the smoked 28pin T-SOP device sitting on my fingertip, it was removed with the judicious application of hot air from my SMD rework station. 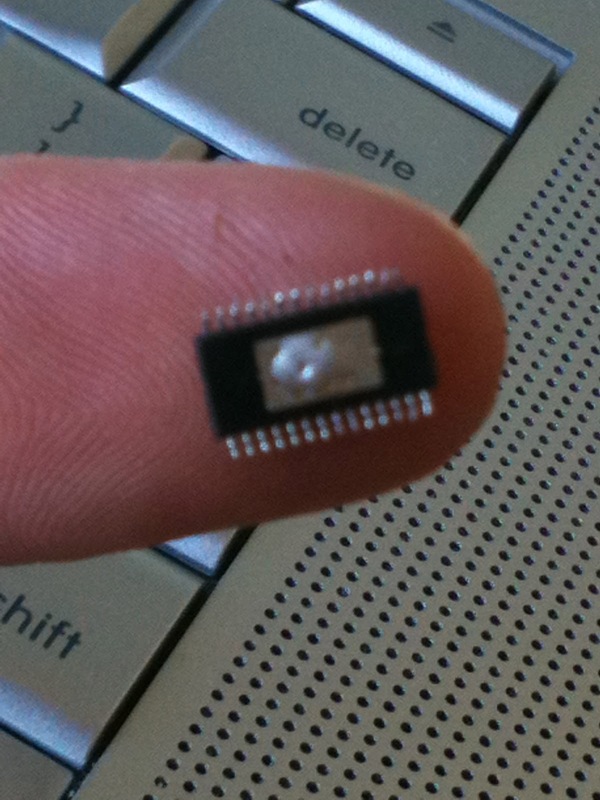 The new IC was attached using solder paste, said rework station and a little swearing. With the machine working again, my attention turned back to fixing the crashes. On the right is a rather mediocre hand drawn circuit diagram on what I came up with to solve the problem. So far the machine has run for about 30 hours without any signs of crashing or glitches, long may it last. Again on the right are the zener, capacitor and led soldered somewhat crudely to the extruder connector for now. 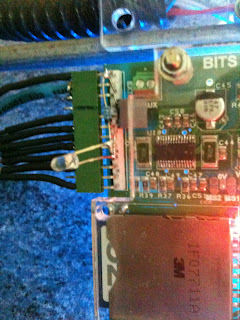 Also of note in the picture, the extruder motor driver IC.